J.J. founded and has produced the SUMMER SHORTS festival since 2007, and founded Throughline Artists, in 2010. The creation of Throughline Artists ensures a future for the SUMMER SHORTS, and allows J.J. to continue to bring together and work with great people. 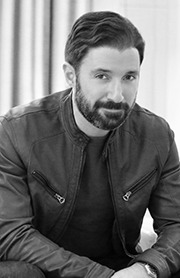 As an actor, his Film and television credits include: Chuck with Liev Schreiber and Naomi Watts; Zero Dark Thirty and The Hurt Locker (Best Picture 2010) both directed by Academy Award® winner Kathryn Bigelow; 10 K (Santa Barbara International Film Festival) and The Mulberry Bush (2016 Tribeca Film Festival) both written and directed by Neil LaBute; We Need To Talk About Kevin; Billy & Billie (DIRECTV); and Law & Order. New York theater credits include: 10 K and The Mulberry Bush by Neil LaBute; Falling Short and Jonathan's Blaze both directed by Academy Award® and Golden Globe® winner Alexander Dinelaris; The Killing (World Premiere) by William Inge; Sundance directed by Matthew Penn; Intermission (World Premiere) by Will Eno; and The Great Pretenders with Amy Irving. SUMMER SHORTS directing credits include: Sparring Partner by Neil LaBute (2018); Wedding Bash by Andrew Leeds & Lindsey Kraft (2017); and In This, Our Time by Alexander Dinielaris (2011). Alex is excited to join the Throughline Artists/SUMMER SHORTS team this year. Having worked primarily in the film and television industry since school, SUMMER SHORTS will be a great dive into the NYC theater world. Past film & TV credits include True Detective S2, The Beguiled, The Killing of a Sacred Deer, Sorry For Your Loss, The Report, and A Beautiful Day in the Neighborhood. Stephen Willems was Literary Manager/Resident Dramaturg for New York’s MCC Theater for twenty-five years during which time the theater was granted many prestigious awards and had its plays produced on Broadway, across the country and abroad. He also assisted in the development of new work by many of the leading younger playwrights in the city through the services of MCC’s Playwrights’ Coalition which he founded in 1998. He has been on the graduate faculty of The New School, and holds an MFA and Ph.D. From The University of Wisconsin-Madison.